Home » Anti-Money Laundering » FinCEN Reports Increased 314(b) Info Sharing. DSA Finds Room for Improvement. Dynamic Securities Analytics, Inc (‘DSA’) analyzed a FinCEN report which provided data on Suspicious Activity Reports (‘SARs’) referencing 314(b) information sharing among financial institutions. • Assisting in compliance with anti-money laundering requirements. In cases where a financial institution files a SAR that has benefited from 314(b) information sharing, FinCEN encourages financial institutions to note this in the narrative in order for FinCEN to identify and communicate specific examples of the benefits of the 314(b) program. 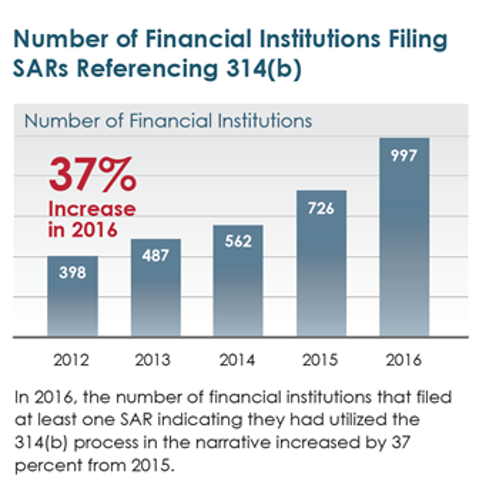 FinCEN found that the number of SARs wherein the utilization of the 314(b) Program was discussed in the narrative have increased steadily over the past five years. DSA took a closer look at the figures provided by FinCEN by comparing the 314(b) numbers against overall and category specific SAR filings. 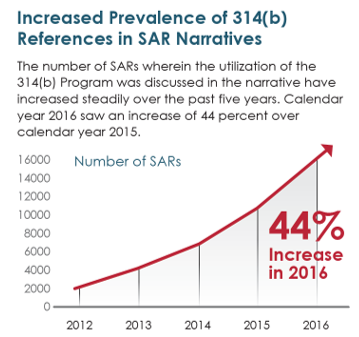 The voluntary nature of some aspects of 314(b) program curtails the number of SARs reporting benefiting from the program. First, not every bank, MSB and broker-dealer is enrolled. For instance, there are about 4,000 broker-dealers registered with the SEC/FINRA but only 2,396 were enrolled in the 314(b) program. 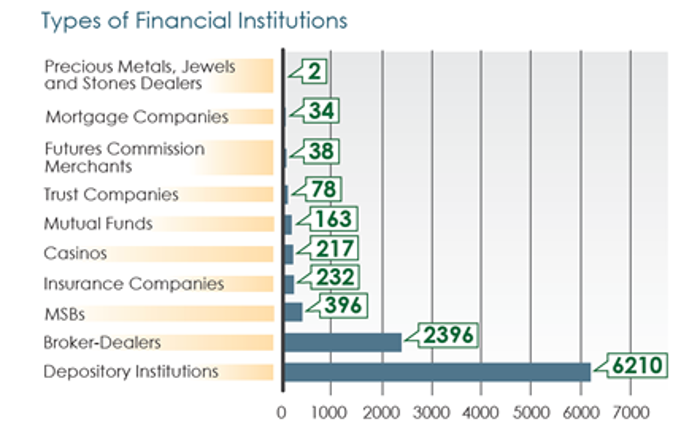 FinCEN provided the graphic below showing the number of institution types enrolled. Secondly, reporting in the SAR form narrative that the SAR benefited from 314(b) sharing is also voluntary. It is likely that many more financial institutions shared information via 314(b) but the data was not included on the SAR form. Or given the additional insight provided by the information shared the FI may have decided NOT to file a SAR. FinCEN notes in the Fact Sheet that a benefit of 314(b) sharing may included: Facilitating efficient SAR reporting decisions – for example, when a financial institution obtains a more complete picture of activity through the voluntary information sharing process and determines that no SAR is required for transactions that may have initially appeared suspicious. However, there is room for a lot more information sharing especially in regards to certain types of suspicious activity. For example, 98% of the time, banks filed “Suspicious Wire Transfer” SARs without sharing information with the bank counter-party. The financial institution would know which bank was the wire counter-party and could have reached out to them to gain understanding of the transaction. Further increasing 314(b) information sharing could result in more comprehensive and accurate SARs, and fewer false positive SAR filings.